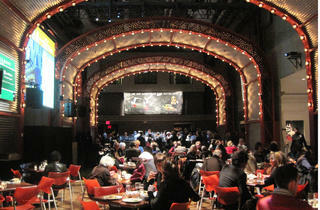 On weekend nights, the BAMcafé, above the Brooklyn Academy of Music lobby, features everything from folk and spoken word to hip-hop and world music. BAM’s NextNext series emphasizes performers under the age of 30, while the SistaFactory regularly puts on shows with female artists. Whhyyyyy don't more people go to BAMCafe?? I finally went for the first time last week for FREE live music Friday, which happens EVERY FRIDAY, even in winter, at 9pm. The space is magically beautiful, somehow old yet modern, with high ceilings and lights that remind you of an old cinema or something. The space is huge, and there were lots of people there. There's also a horseshoe bar, and while drinks are just standard, it's a really fun place to come for something to do on the earlier side on Friday. Come get a drink, enjoy being part of the crowd and listening to whoever's onstage. At 10pm, you can either call it a night or move on to one of the nearby bars. 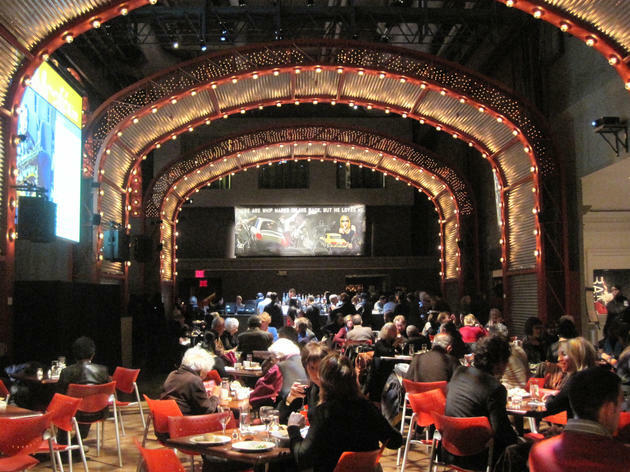 I would not go out of the way to go to Bam Cafe and I would only recommend it to those who are at the Brooklyn Academy of Music for a musical adventure. If this wine bar/restaurant was a separate entity outside of the theater, I'm not sure if it will receive as much as hype as it does. The space is beautiful. The uber high ceilings and masquerade-like decor with the animal plush dolls hanging from the ceilings creates a very unique and magical ambiance for its patrons. I was not at the cafe for any special occasion, just for an hour or so before a show I got free tickets to through my company. It's on the second level of the theater and can seat many many people. I can see it being a perfect venue for parties and many different types of events. I started off with wine. The wine is cheap, relatively speaking. A glass of wine was within a small range of $6 to $12. We continued with the chicken teriyaki skewers, which was very salty. I would not recommend it at all. The teriyaki marinade was barely noticeable. Then we continued to another small plate of their spiced curry lentil dip, which was my favorite for the evening. It says "spiced curry" but it's not spicy at all. It has a very thick consistency because the lentil beans aren't reduced down to a smoothie, and it has enough zing to have with the pita bread. We then finished off our pre-show wine with the cheese plate. The cheese plate did not have any jams or honeys, just a few pieces of fruits. Again, I would not drive out just to eat at BAM Cafe, but it's definitely a looker if you are in the area.